Coffee machines are handy on those chilly days when you need a beverage hot and sweet. The performance of a coffee maker machine is determined by a number of factors most importantly the type of coffee filter. However, finding the right K cups isn’t a cakewalk. Nonetheless, that shouldn’t be a cause for concern for we’ve put down for you all that you. We trust you’ll enjoy this post and we guarantee that the following are next to none in their competition in terms of functionality, convenience, and safety. 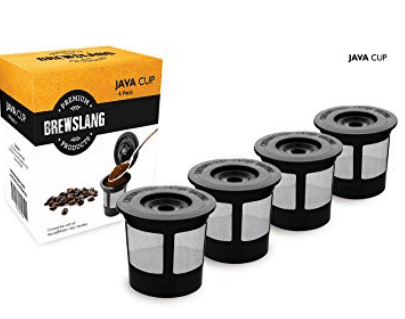 The ReplacementBrand reusable coffee holder and filter set kick off our look at the best K cups. The fact that the manufacturer gives you room to use it with various Keurig double-digit model system is a nice touch. The set is compatible with B30, B40, B50, B60 and B70, K10 MINI Plus, K45, K55, K60/65, K70/75/79 units. K40 and K15 units do not support this set. Not everyone likes coffee and with this set in your coffee machine, you can choose to go for cocoa or tea instead for added variety. 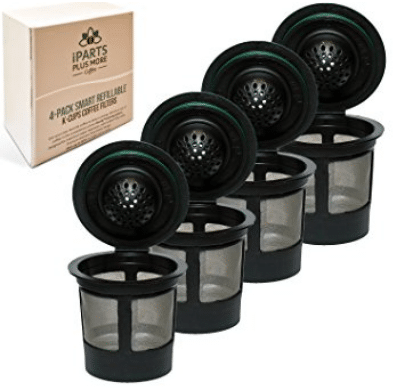 If you’re looking for a coffee filter set that will get your day started just right and give value to your money, then this has to be it. 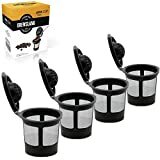 While at first glance this Greenco set might not seem as appealing as others in its class, this 3 pack coffee filter set seeks to give you the best possible taste out of your roasted coffee beans. The set allows you to comfortably use it without removing the filter holder so you can brew your coffee without unnecessary spills. It’s been created with 100% BPA free and dishwasher safe material so that your safety and hygiene is in check while you enjoy your coffee. They work well with most Keurig K-cup, Cuisinart K-cup, and Mr.
Coffee brewing systems except B30, B130, B150, and B155. Using the component couldn’t be easier. Just pop the capsule lid open, pour in your ground coffee and then put the capsule into your own coffee machine and brew and you’ll be drinking top-tier coffee in no time. Just that way, you get to enjoy your coffee just the way you like it without having to rush to Starbucks. Another market-leading brand that is known to produce world-class coffee while keeping the taste, aroma, and flavors of your coffee intact. The reusable set couldn’t have been more versatile and appropriate. It is great with almost all Keurig 1.0 and 2.0 models (K15, K31, K40, K44, K45, K50, K60, K66, K70, K77, K100, K135, K140, K250, K300, K350, K400, K450, K500, K550, B31, B40, B44, B50, B60, B66, B70, B77, B100, B140, B200) The makers say that they’re compatible with elite, classic, ultra, ultimate platinum and special edition coffee makers too. Why else you would want to lay your hands on this coffee filter set is that rather than restricting yourself to pods only, you can opt for a different blend of coffee or tea if you prefer. The company also provides 100% money back guarantee so you can return it in case it doesn’t fit well. 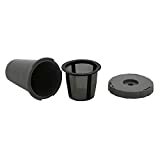 Filter your coffee perfectly with this reusable K-cup set. This is one of the most sought-after coffee filters that lets you enjoy a strong, robust coffee anytime you choose. For a budget coffee filter that performs like much more expensive types, the Keurig My K-cup has no worthy competition. You’ll get to use it with most Keurig coffee machines as the K10, B40elite, B60 special edition, K65, and the K45 versions. A simple rinse under clean running water is all that is needed to clean the components. If you are the one who adores the fancy packaging, the Keurig packaging box should suit you. Simply put, preparing a delicious flavor of coffee that you can enjoy to the last drop has never been this easier. 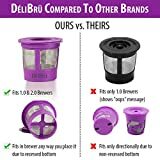 The Delibru 4pack coffee filter set is worth a spot on our shortlist of the best K-cup sets on the market. It is suitable whichever way you place it in any Keurig machine, both Keurig 1.0 and 2.0. Cleaning couldn’t be less hassle; this sturdy looking filter is dishwasher friendly and features a ridge-less design on the inside that’s meant to make cleaning quick and easy. Of course, we’re all better off using coffee filters that won’t mess your table or countertop, the tight seal is effective at preventing spills. The list of the features is not over yet until we mention the 100% money back guarantee for the doubting Thomases that need assurance before investing. This item certainly deserves being in your cart. When the makers say that these reusable coffee filters are convenient, they mean exactly that. 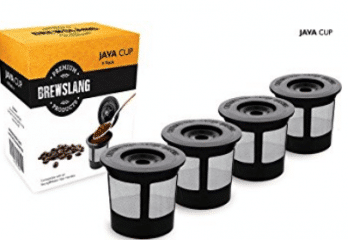 You get quantity without price tag with the 8 reusable K-cups that come with this set. This makes it perfect for your whole family. They come in attractive rainbow color options which not just look good but also work well. These coffee filters work excellent with almost all Keurig 1.0 and 2.0 models thanks to its flexibility. If you sometimes swing between tea and coffee, this coffee filter’s got you covered still. It is reassuring to know that the company gives 100% money refund to customers that aren’t impressed with the product. For coffee this good, you really can’t expect anything better. These filters come 4 and are remarkably good at what they do whatever you want to brew. 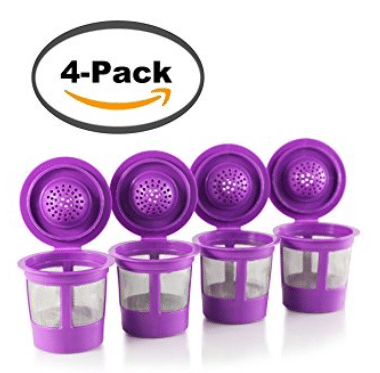 The set includes 4 reusable filters meaning this machine is ideal for big families. It is still handy when everyone in your family has a different taste for coffee; they all get to brew their own coffee without mixing up the flavors. It fits most Keurig coffee machines, Breville K-cup, Mr. Coffee K-cup, and Cuisinart K cup. It is made tight and sturdy with a tight lid seal and that can only mean one thing, non-leak. Another reason you’d want to use this product is that the company backs the workmanship with 100% money back guarantee. This is truly a unit you can rely on. As with none of the other coffee filters, this is compatible with all Keurig coffee maker machines. Whether you coffee maker is first generation, Keurig 1.0 brewer, the updated Keurig 2.0 machines. 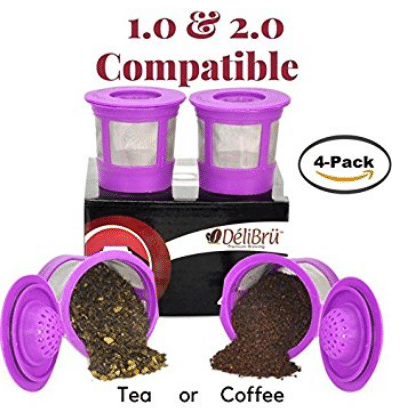 The beauty of this unit is that it comes with two fill lines for increased convenience; you decide whether to use the cup or travel mug brew sizes. The single unit features a well-thought-out design that spells out durability. 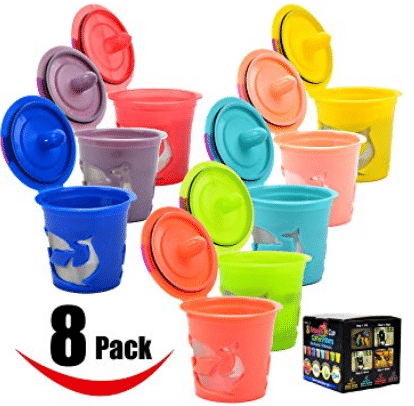 It’s built from 100% BPA free material for your safety and is dishwasher safe. It is a great way to brew a cup of gourmet coffee without sacrificing the taste. With such quality, you can rest assured that you’ll get the same first-class coffee without needing to hit Starbucks every day. The 4 stainless steel micromesh filters are as safe as they’re comfortable. In fact, all components are made from materials free from BPA, lead, and other toxins and are dishwasher safe. This product is not made for Keurig 2.0 machines. The manufacturer recommends that you use them on B40, B41, B45, B50, B55, B60, B65, B66, B70, B71, B75, B76, B77, B79, B140, B145, B150, B155 – K40, K45, K50, K55, K60, K65, K70, K71, K75, K76, K77, K79, and other brewers made after 2007 like Elite, Classic, Ultra, Special Edition, Ultimate and Platinum. . If for whichever reason you decide to return this unit, the company is willing to give a refund. While at home, if you can’t choose between coffee and tea, why not choose all? This outstanding set is designed to give the best tasting Java day and day out. 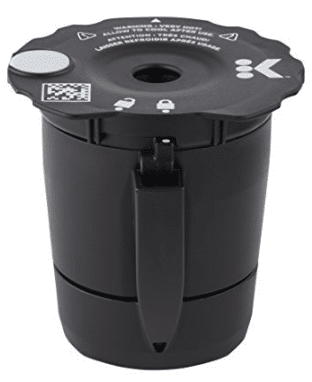 It is ideal for Keurig B31, B40, B44, B60, B50, B66, B70, B77, B200, B140, K31, K40, K44, K45, K50, K60, K66, K70, K77, K100, K135, K140, Breville K-cup, Mr. Coffee K-cup, and Cuisinart K-cup. 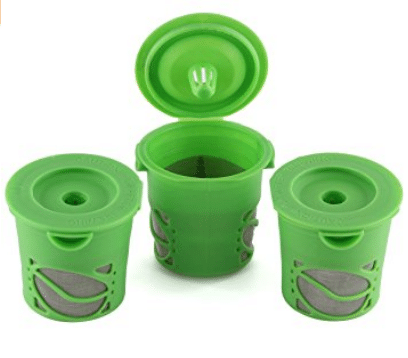 By using 100% BPA free and dishwasher safe material, the manufacturer significantly cuts down any risks and difficulty in washing and doubles the value of your favorite drink with these reusable filters. 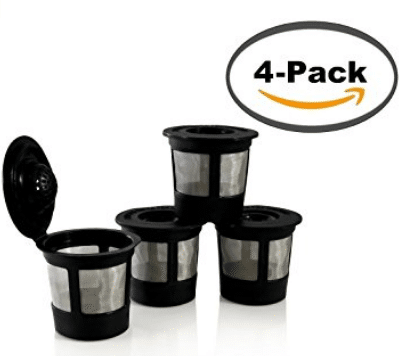 For the perfect breakfast blend coffee, this 4 pack set of coffee filters is a must and well worth popping in your cart. Compatibility with your coffee maker: coffee filter baskets vary with different coffee makers. 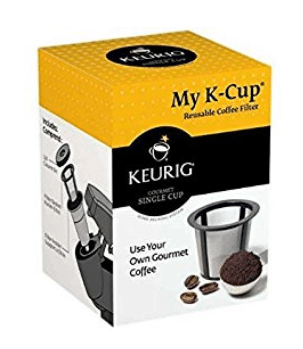 It is crucial to confirm that the K-cup you intend to buy will fit well with your coffee maker. Ease of Cleaning: Because you’ may use your filter several times every day, you need a unit that’s easy to clean. Price: Although most of the products are moderately priced, you may want to get a set that offers more filters if you have a big family. This will save the cost of buying separate K-cups. Design and color: Some brands offer a wide assortment of colors to fit with your color scheme. You may want a color that matches your kitchen décor. Safety: Opt for BPA free components because they do not add any harmful chemicals to your coffee & keep it completely safe for you to enjoy it. 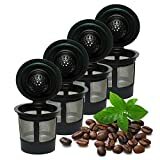 If you are genuinely tired of frequently replacing reusable K-cups for your coffee maker then here is a solution for you. If you truly want to enjoy a full flavor to perk you up whatever the time of day, add one if not all the sets to your wanting cart. Are you tired of buying the coffee filters again & again then we have the solution? Replace your filter with a reusable coffee filter which is not just necessary for your kitchen but also eco-friendly. These filters are long lasting & really very affordable. 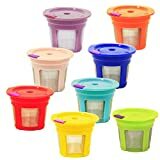 Following is the list of top ten reusable coffee filters of 2019.